My Grandma Faye truly was the kindest soul and she lived her life giving service….mainly feeding all of her grandchildren! Any time we visited her, she treated us like royalty and the spreads of food she prepared for us looked as if she was feeding the masses. She aimed to please and making food for her family was one of the ways she showed her loved for us. Her meals were traditional and always included a protein, a vegetable, a salad, and dessert at every meal. She was known for her beautiful salads. My husband become known as the “salad scraper,” as he could be counted on to finish off every morsel of salad left in the bowl after everyone had eaten. Her dressing was always simple. It had the right amount of sweetness with a touch of sugar, yet balanced with perfect tartness from the apple cider vinegar. My husband could drink this stuff straight from the bottle! This is the perfect salad for your Easter Sunday meal, a party, or a simple lunch. The beauty of it is that you can change up the fruit and cheese selections, making it a very versatile salad. 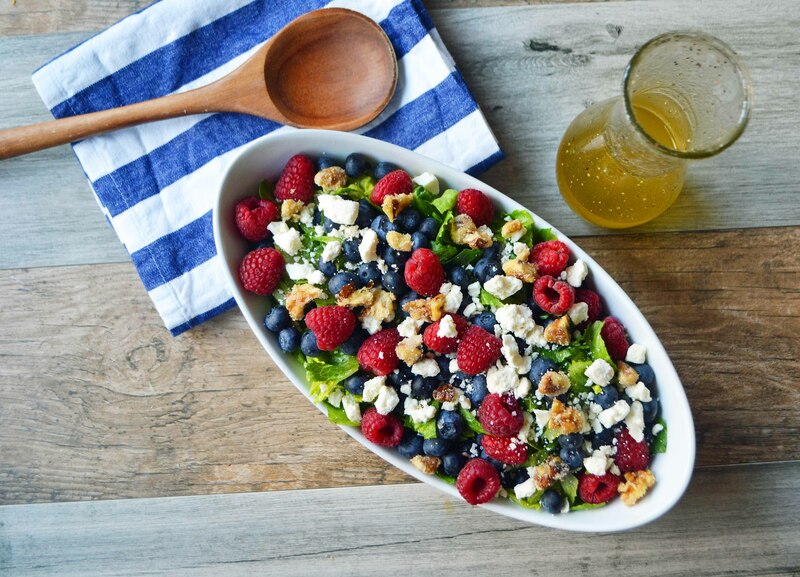 I’ve named it the, “All American Nuts and Berries Salad” because it looks like an American flag with it’s red, white, and blue colors. 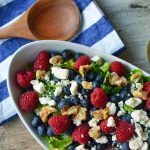 To make this Nuts about Berries Salad, you can use fresh raspberries, sliced strawberries or pomegranate arils (when in season) to give it that radiant red color. Blueberries or blackberries give it a touch of blue. 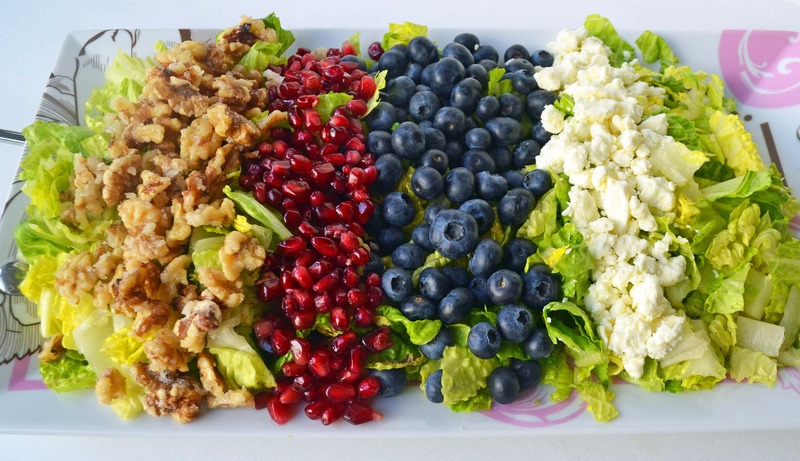 Add any type of white cheese such as tangy blueberry goat cheese, salty feta or creamy mild mozzarella. My kids are obsessed with mozzarella cheese in this salad because it’s milder than feta or goat cheeses. The candied walnuts round it out by adding a sweet crunchy element. I tend to use romaine hearts, found in a package of 3-6 at the grocery store or Costco, in my salads because they have the crispness of iceberg lettuce but more nutritional value. 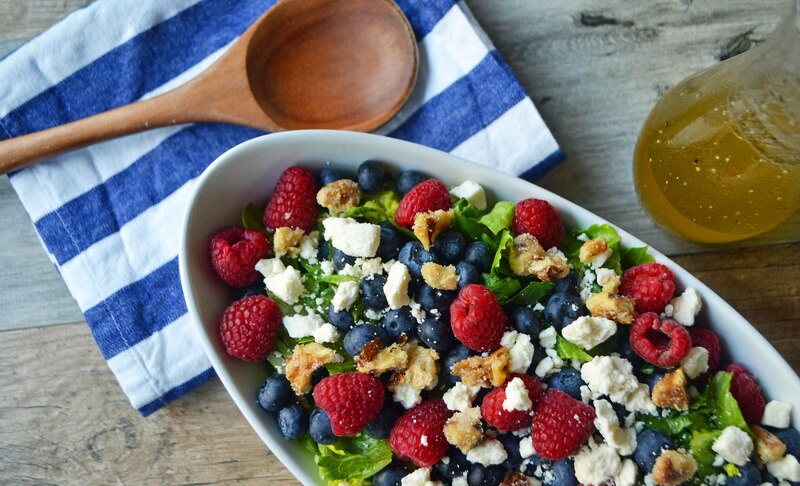 This red, white, and blue salad combines fresh fruit, tangy feta cheese, and sweet candied walnuts to be the perfect salad for your next gathering. *You can find romaine hearts in a 3 pack in an grocery store or in a 6 pack at Costco. In small saucepan, heat walnuts and sugar over medium low heat, stirring often. As the sugar starts to melt, stir to coat walnuts and to keep from burning. Once sugar is melted and walnuts are nicely coated, remove from heat and place candied walnuts on wax or parchment paper. Let cool. In small bowl or shaker bottle, mix oil, vinegar, sugar, parsley, salt and pepper. Place in refrigerator until ready to serve. 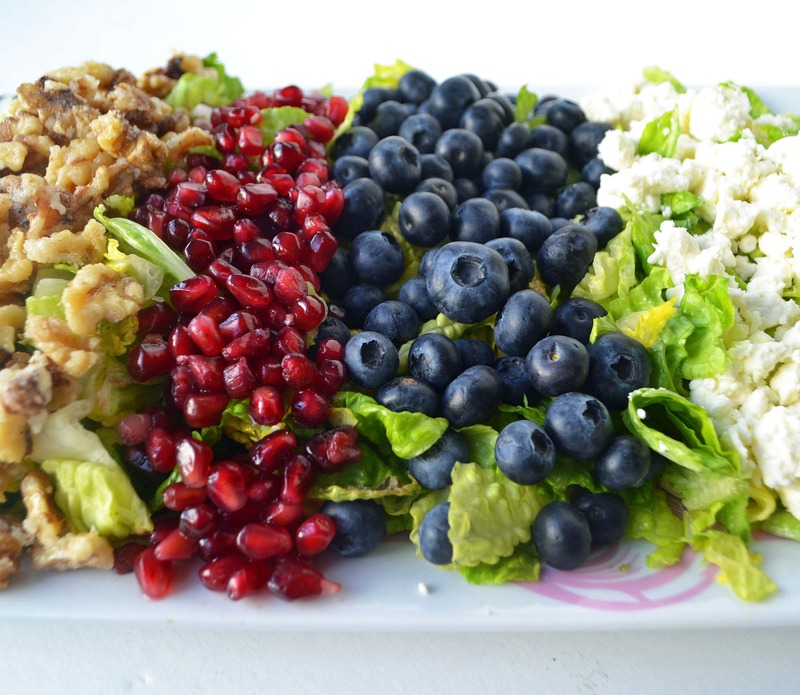 On large platter or in bowl, layer romaine hearts, pomegranates or strawberries, blueberries, feta cheese, and candied walnuts. Toss with sweet dressing and serve immediately to ensure freshness. You are the best, Shirlyn! I love that you try out so many of my recipes. You are the sweetest. xoxo Happy Easter and enjoy that great family of yours! This is one of my very favorite salads….the combination of feta cheese and candied walnuts is so yummy. Thank you Modern Honey!